Here are some examples of how to mix minor pentatonic and dorian. 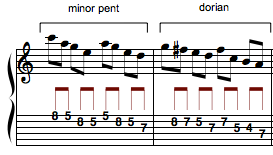 I’ve used eighth notes to make the difference between minor pentatonic and dorian easier to see. Use the same lick and vary it rhythmically. Long notes are always effective. They act as milestones for listeners simply because they last longer than the notes around them. Notice that I removed a note from the original. It wasn’t working with the rhythm I was using. Repeated notes are also very effective. Next post: open chords and alternate tuning.